Mid Century For This Century :: Eames Elephant. We all love Eames, right? And they clearly loved us enough to make such a wonderful piece as their 1945 toy elephant made of plywood. But not enough to make it actually available for the public buy. Only a few exist and when you do find them be prepared to part with tens of thousands of dollars. Vitra started selling miniatures of the toy elephant for a mere $145.00–we are talking about the miniature, which is less than three inches. So much for getting one for your own kiddo. Until now. Vitra has launched this great and very lovable sculpture for the public, but this time it is made of plastic. PLASTIC! That fellow from the pool party in The Graduate was on to something. And Vitra is launching this just in time for Charles Eames’ 100th birthday. Happy birthday to US! Available at Modern Seed for just under $300. I know, I know. It’s a touch spendy. But man–oh so gorg! Would you drop that chunk of change on one? Preeety darn tempting, no? 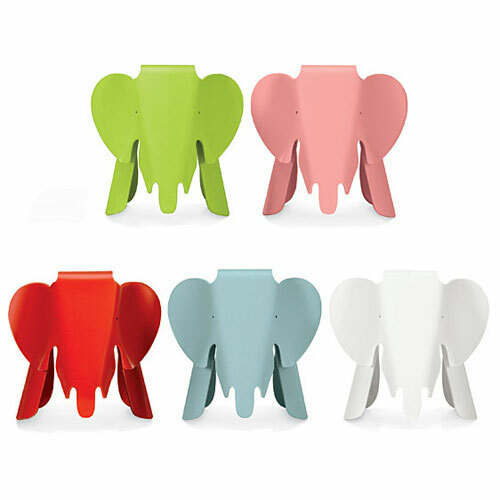 Tagged with eames plastic elephant for kids, modern seed, Vitra. I don’t know that I would ever spend $300 on an Eames Elephants for my daughter but my grandmother did and I couldn’t be more pleased to have it in my home. Hurrah for grandmothers and that little girlie of yours is such a cutie patootie! I cannot see spending that much on something, for wee ones or for me!! I’m such a cheapskate! We wouldn’t do it these days, as I don’t know where the elephant would live. But, oh, someday! Hi Alix and Dottie ! These plywood animals are my favorite.